The used car market is full of great choices, but some used cars have hidden problems that aren't obvious during a test-drive. We hope this guide will help you recognize signs of potential problems and make a more informed decision. 1. Signs of major problems or safety concerns that should tell you to avoid the car. 2. Minor issues that need to be taken care of if you decide to buy a car. Knowing minor issues can help you in negotiating the price. If you found signs of a major problem with the car, there is no point to inspect it further, move on to the next car. Major problems include a substantial rust damage, engine and transmission problems, issues with electronics, previous serious accidents, flood damage, lack of maintenance or anything that makes the vehicle unsafe or might require expensive repairs. Minor issues are the ones that don't affect the safety or reliability of the car or can be easily corrected, including worn tires, minor suspension and brakes problems, scratches, dents, etc. If you have a small magnet, it might be useful in detecting repaired corrosion spots. 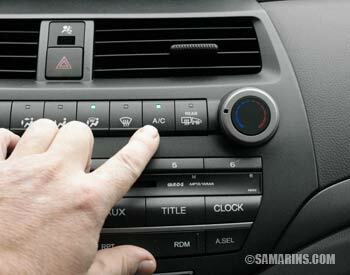 You might also need a paper towel to check the engine oil and a USB cable or a CD to check the audio system. If you will be using a child seat, it's a good idea to take it with you, so you can check if it fits. You also need a knowledgeable friend who can help you consider pros and cons and make a sound decision. It helps a lot if you google common problems of the particular make and model you are interested in. You will know what to expect in the future, as well as what to watch out for when checking the car. As a final step, we recommend having the vehicle inspected by a mechanic of your choice before signing the deal, read more below. First step: quick look, is there any reason to avoid this car? Start with the quick walk-around. 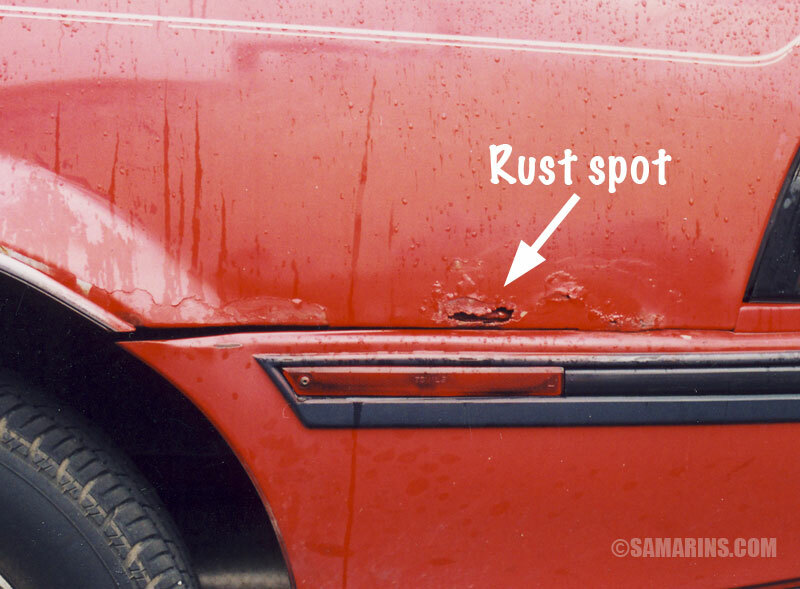 Rust spots like this one should tell you to avoid this car. Why? 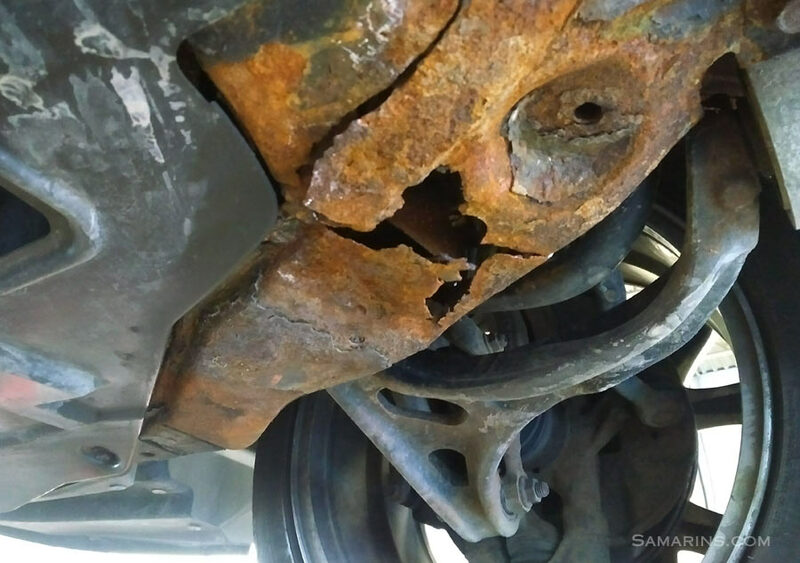 Because major components underneath the car could be rusted too, making the vehicle UNSAFE. 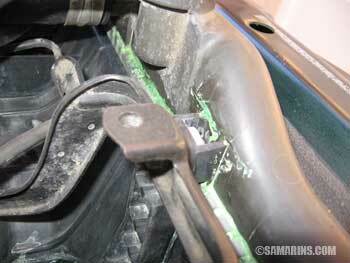 Look for example, at these brake lines, or this subframe (engine cradle). You can catch some of the engine problems when the engine is started cold, after the car sat for a while. 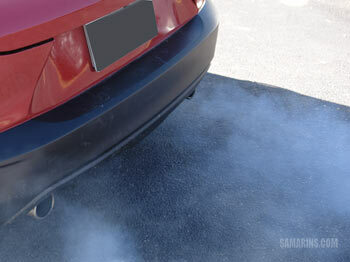 If the engine rattles at a start-up or you can see a blue or white smoke that smells like a burnt oil like in the photo, avoid a car even if it's a small puff. Have a look inside. 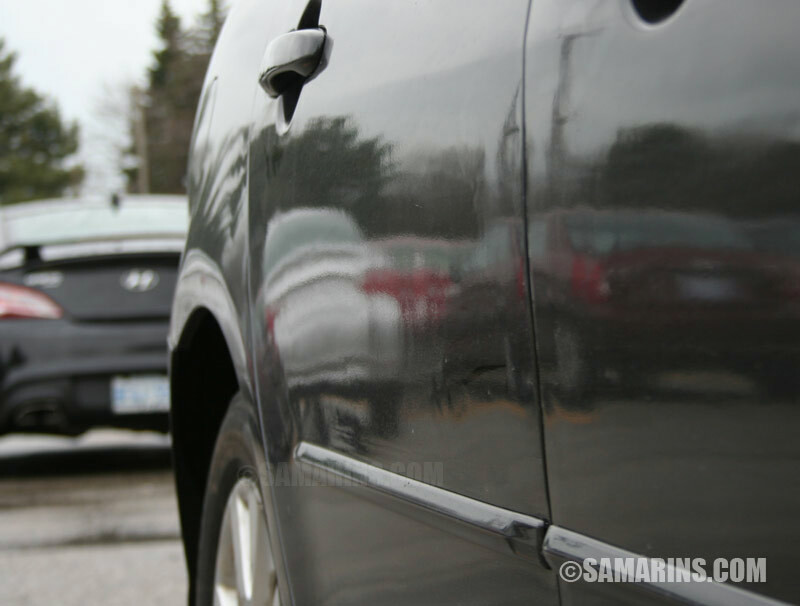 Most dealers detail cars before showing, but steer clear of the car if it looks really dirty. 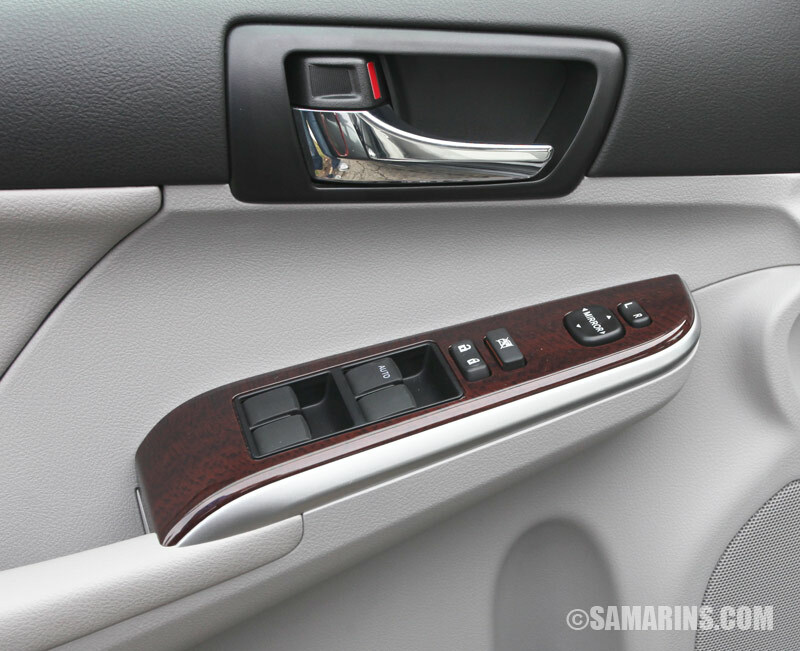 How do the steering wheel, driver's seat and the inner door handle look like? Are they badly worn? Does it smell bad inside? Bad smells inside the car are difficult to get rid of. Are there any warning lights staying on? This car has the SRS (airbag) light on, it will be expensive to repair, this car should be avoided. Problems with advanced safety systems like Blind Spot Monitoring or Forward Sensing Camera or Radar are expensive to repair too. 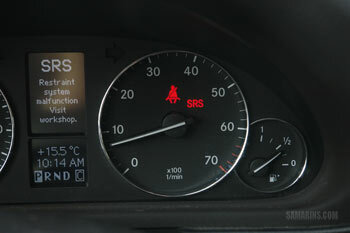 The "AT" (transmission) or 4WD warning lights also indicate costly problems. Does the brake pedal go down too far or feel spongy? Look for another car. Does the transmission take too long to engage when you shift into Drive or Reverse during a test drive? Do you feel a strong jolt when the transmission engages or shifts? Avoid the car; there are plenty of other cars available. Are there any signs that the car was used as a rental vehicle? Read here how to spot it. Buying an ex-rental car is not always a bad idea, as long as the price reflects that and the vehicle is in good shape. Check the reflection to see if all panels are lined up and to catch signs of body repairs. Look at the reflection of the side of the car. It can tell you if all panels are lined up and you can catch signs of body repairs. This car looks OK: panels are lined up, and the paint texture looks uniform. Click on the photo to see a larger image. Look closely at this rear door, click to see the larger view. The rear door of this car shows signs of body repairs. Tap on the photo to see a larger view. Not only the texture is uneven, you can see some lines right above the moulding. Those lines were left from sanding. Sanding is done to smooth out the auto body filler and the primer to prepare the surface for painting. This car is a 2007 model, but it was built in December of 2006. 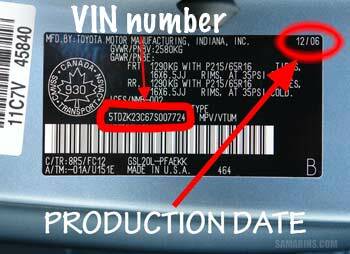 Check the production date on the VIN sticker. When choosing between two cars of the same model year, the one that is built at a later date is a better choice, all else being equal. 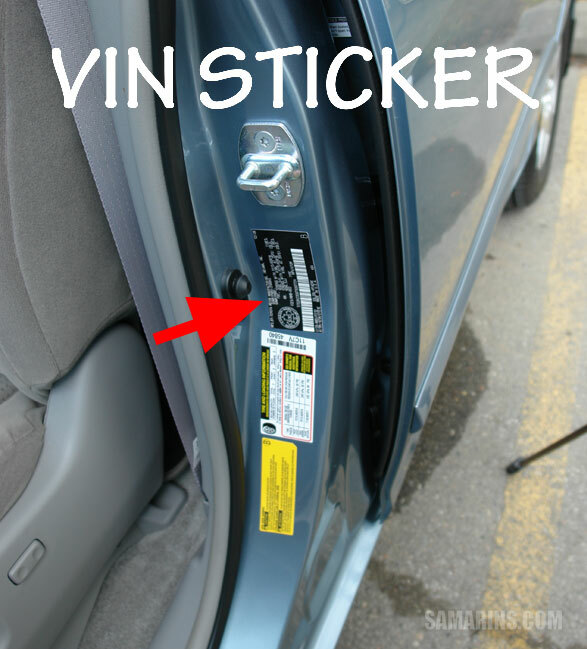 See where the VIN sticker is located. 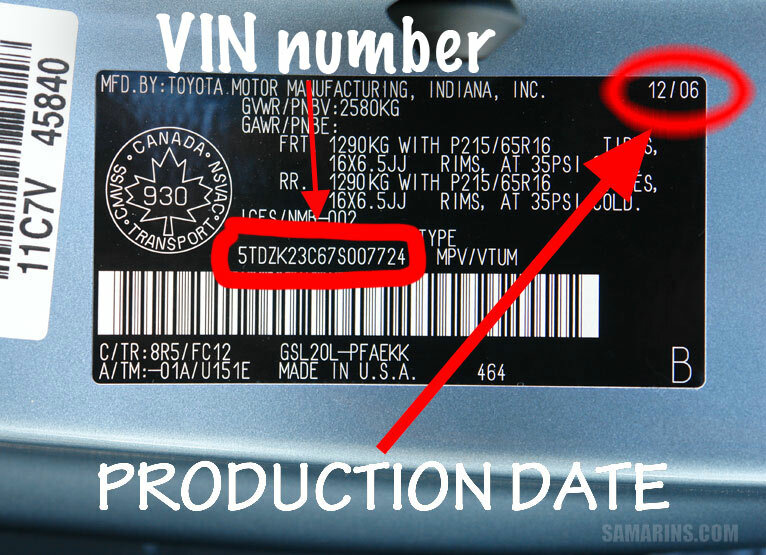 You will need a VIN number if you want to check the vehicle history records or recalls. Look carefully at the windshield. Note any chips, scratches or other damage. Some chips and star cracks, if large enough, can cause the vehicle to fail a safety inspection. Replacing a windshield costs from $320 for an aftermarket windshield to over $1,000 for an OEM part. This broken wiper scratched the windshield in this car. This scratch will produce a glare when driving at night. 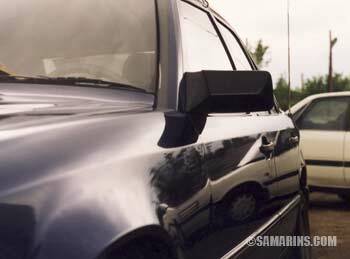 Similar scratches can be made by sand particles caught under the wiper blades. 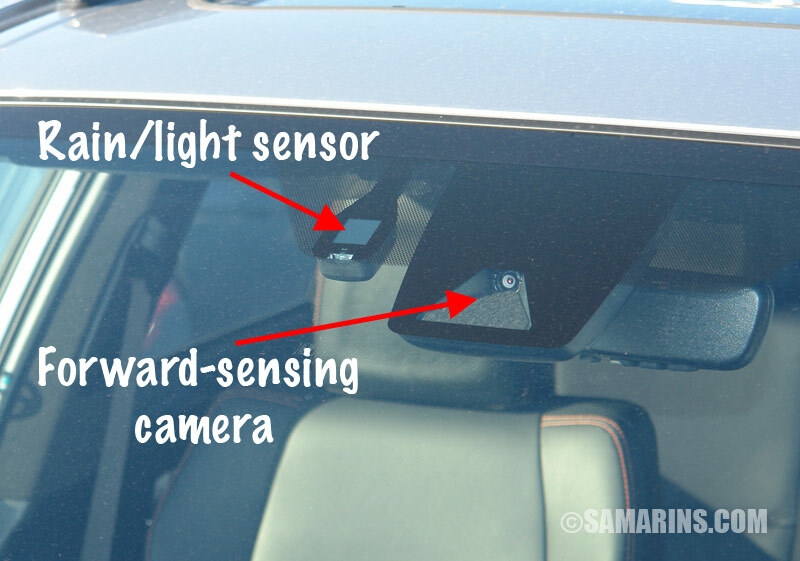 This car has a front-sensing camera and a rain sensor attached to the windshield. 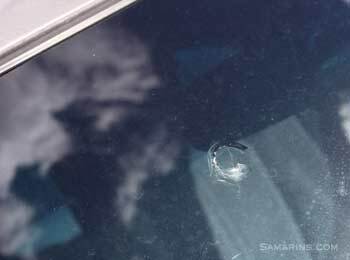 If the windshield needs to be replaced, and there is a front-sensing camera or radar sensor attached to the windshield, it might also need a calibration after the windshield replacement. Check if the headlights are not fogged up and all the lights are working. Many modern cars have LED strips built inside headlights or taillights and they look great. 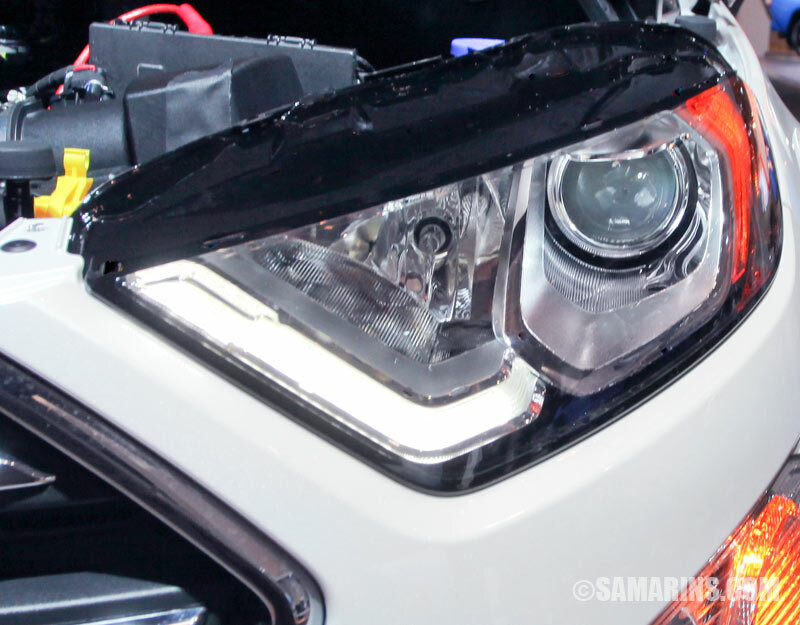 The problem is if the LED strip inside the headlight stops working, the whole headlight unit might have to be replaced, which is more than $1,000 in some cars. It's not like before, change the bulb and the problem is solved. The OEM high intensity discharge (HID) lights are also expensive to repair. 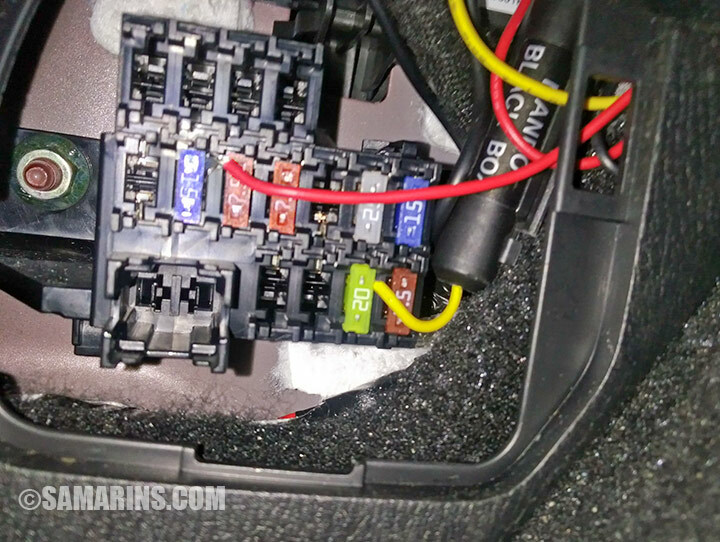 First signs of LED strip failing is when one headlight flickers or glows darker than the other. The first symptom of a failing HID light is when one light turns on right away, while the other turns on after a considerable delay. Watch out for moisture and fogginess inside the headlight. 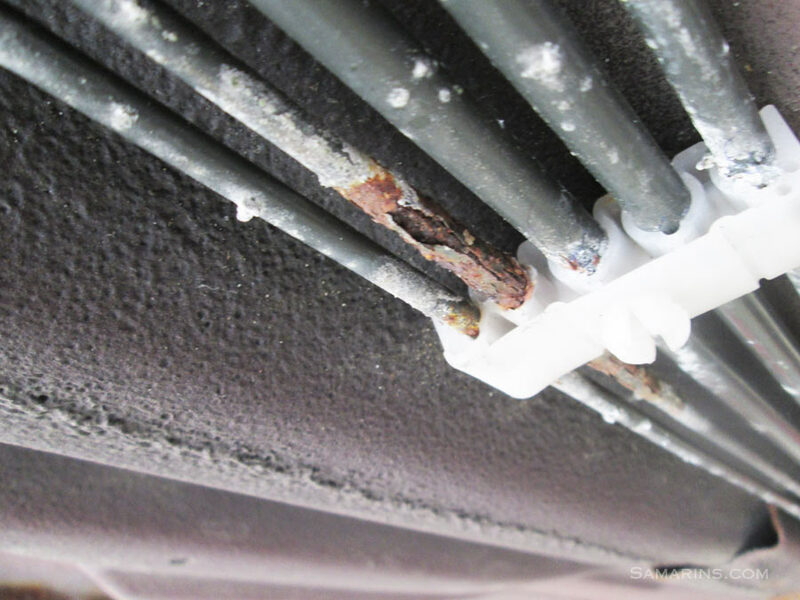 See more examples: how to spot signs of accident repairs. Some aftermarket low-profile rims bent easily. Check the rims. Some aftermarket alloy rims, especially low-profile rims like the one in the photo bend easily after hitting a pothole. 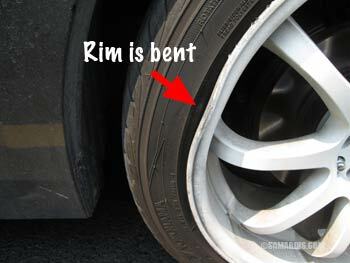 This rim is bent on the outside, but often the damaged spot is on the inside. The only way to catch this is during a pre-purchase inspection when the car is lifted on the hoist. A symptom of a bent rim is a vibration felt on the highway, although it's not always easy to detect during a short test drive. Replacing a rim like this could be expensive. Original equipment alloy rims are stronger, but they too can get bent. Check the tires. Do they look worn out? Do they have cuts or other damage? This tire in the photo shows cracks in the sidewall, it will need to be replaced even if the tread is still OK. Are all the tires of a reputable brand or a no-name product? Do all tires show even wear? Uneven tire wear indicates problems with the suspension or wheel alignment. This tire has a bulge or bubble on the sidewall. It's unsafe and must be replaced. 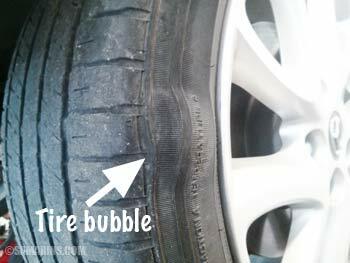 This tire has a bulge (bubble) on the sidewall and must be replaced. A bulge is not repairable, and the tire with the damage like this is unsafe to drive. 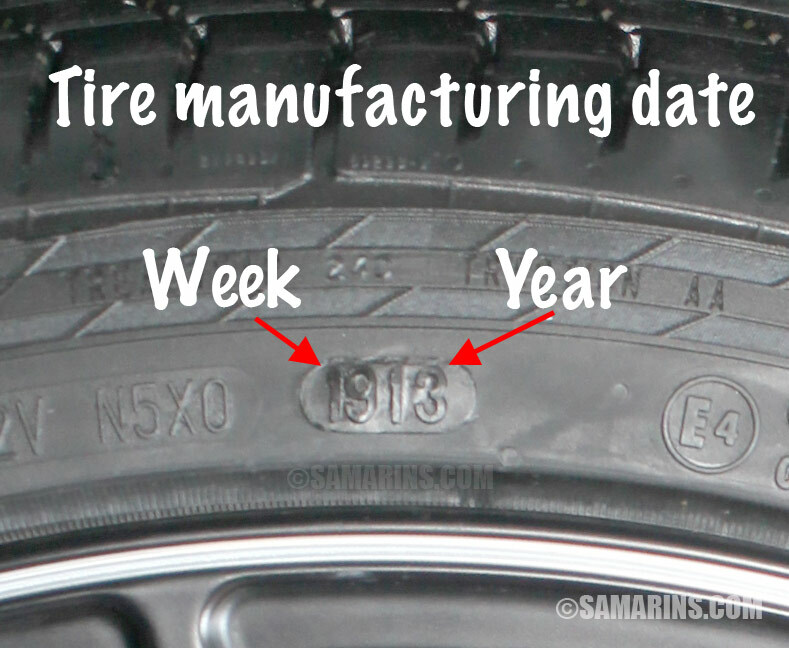 This tire was manufactured in the 19th week (May) of 2013. 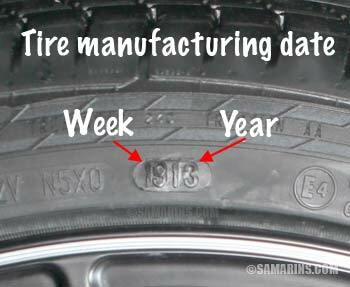 The last 4 digits of the DOT number on the tire show the manufacturing date of the tire. Why is it important? If a tire is very old (more than 6-7 years), even if the tread is in good shape, it might need to be replaced soon, as tire rubber degrades over time. Check if the tire size matches the size specified in the tire sticker. A tire sticker is usually located close to the VIN sticker, see above. New tires have the tread depth from 10/32" to 11/32". The tire in the top image is almost new. 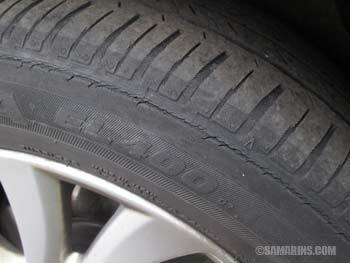 New tires like this can last up to 40,000 miles. The tire in the lower photo might still pass the safety inspection, but is worn out to about 4/32", which means this car will need new tires soon. Look at the wear indicator bar. A set of tires, depending on the size and brand costs from $400 to $1200 to replace. Low-profile 18" and larger tires are more expensive. Run-flat tires cost a lot too. You can look up the prices at TireRack.com. Check if the car has at least two key fobs and both are working. Test if both key fobs are working. 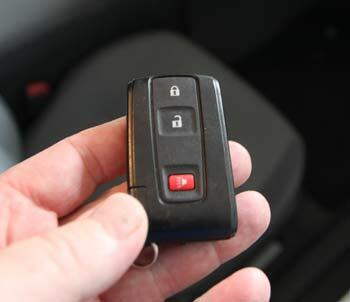 A new car comes with two or three keys or key fobs; ask how many come with the car. If there is only one key, and it's lost, the car would have to be towed to the dealer to cut and program a new key fob. That is not cheap. Check if both front seats slide and recline. Check the condition of the seats. Look for burnt marks and other damage. Minor damage can be repaired; ask if the dealer can arrange for repairs. 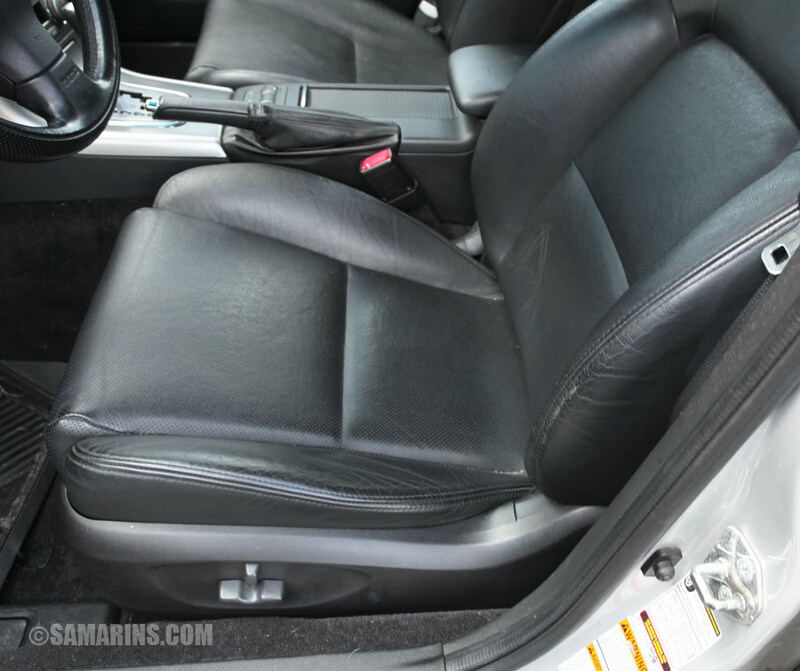 Check if both front seats slide and recline. Does the seat feel loose? Does it rock back and forth? Does the seat heating element work? Common problems with seats include failed seat heaters, broken seat frames and abnormal noises when sliding or reclining. The power seat mechanism is expensive to repair. Check the condition of the seat belts. 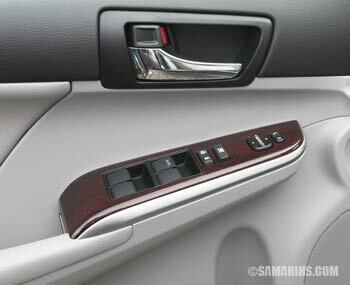 Test power windows, power locks and mirrors. Window regulator problems are common in many cars. Sometimes a window goes down well, but goes up very slow or crooked. Loud abnormal noises when the power window operated indicate a problem. 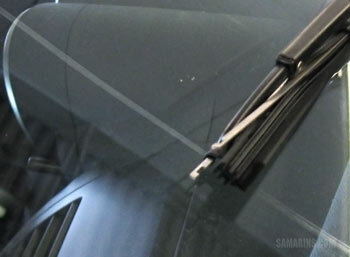 The rear wiper is another part that fails often in older cars. Test all wipers and washer functions. The one thing that consistently draws owner's complaints in modern cars is the infotainment system. Here are some of the common complaints: areas of the screen lose touch sensitivity, or the screen fails internally (over $1,000 to replace). The system is slow to react, glitches or reboots by itself. Some phones are pairing, some don't. 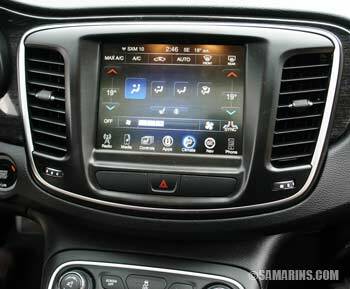 Infotainment system problems are also expensive to repair if out of warranty, and you will have to visit your dealer for that. This means test the infotainment system carefully. If having a phone connected via Bluetooth is important for you, try pairing your phone. See if the system plays your music. Test the touch-screen and other functions. 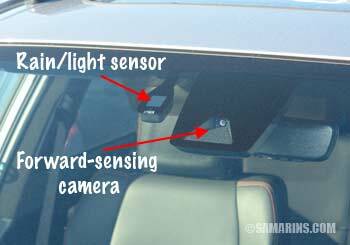 The rear view camera (if equipped) needs to be tested too. This is another problem area in many modern cars. 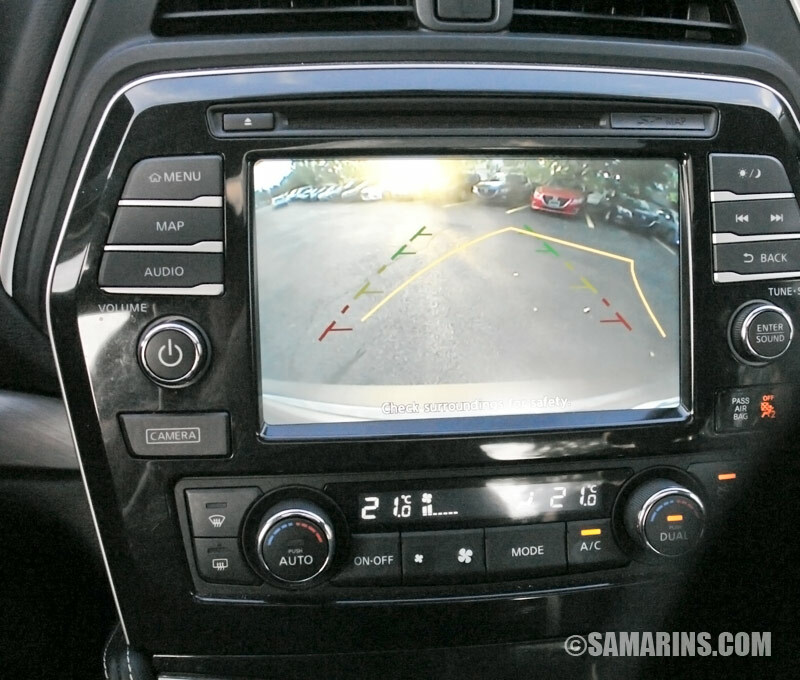 A rear view camera may function intermittently, or the image could be blurry or distorted. 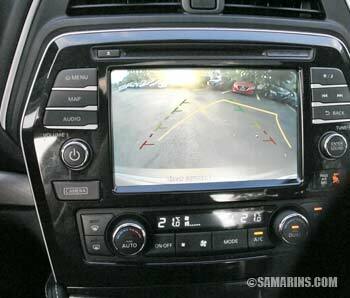 The rear view camera is also expensive to repair. With the engine running, turn the A/C on. You should feel cold air coming from the vents soon after the A/C is turned on. 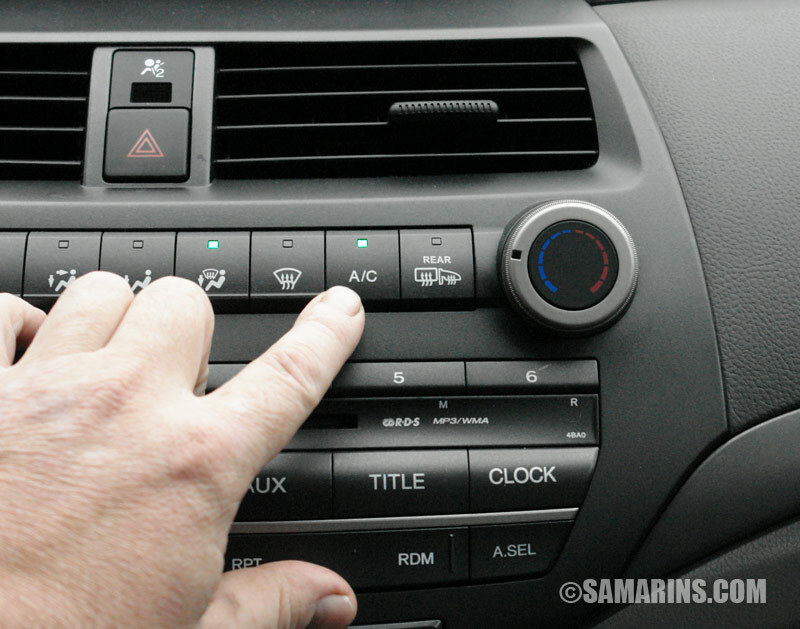 The air conditioner problems are common in many used cars. With the engine running, turn the A/C on. You should feel cold air coming from the vents soon after the A/C is turned on. Test all the heater fan speed settings. Does the heater provide a good heat? Watch out for musty smell from the vents. 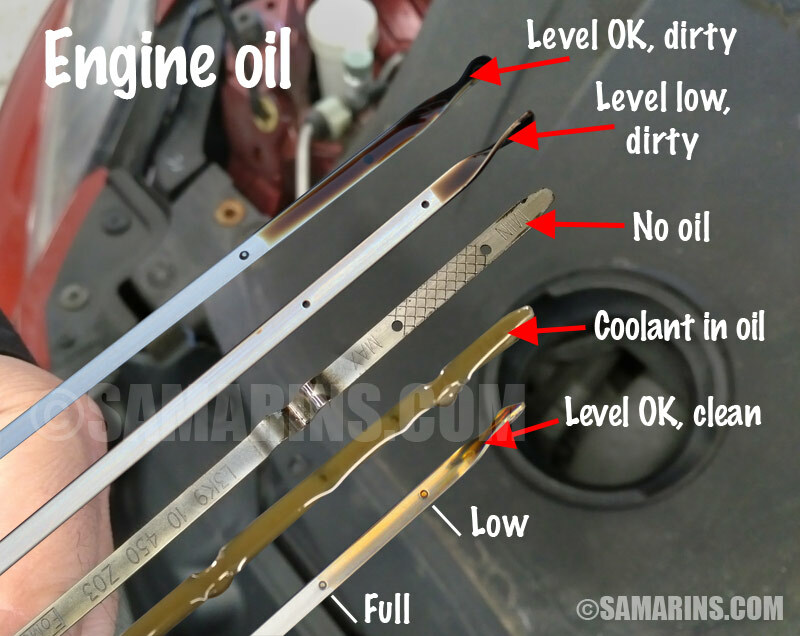 A burnt oil smell from the vents indicates possible oil leaks in the engine compartment. 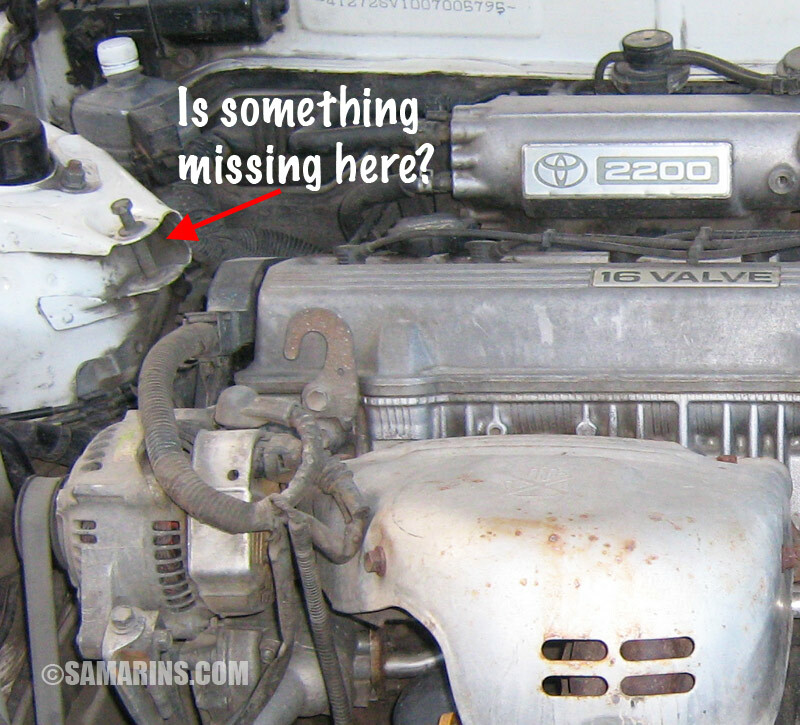 An antifreeze (coolant) smell is a sign of a problem too. If the vehicle has a separate HVAC system for the rear-seat passengers, test it too. What are the signs of flood damage? This car in the photo has been flooded. You still can see the water level mark in the speaker cover. 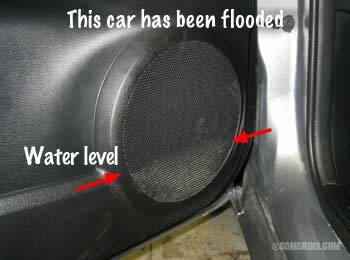 If a car has been flooded, it's more likely to develop many problems in the future. Modern cars have many electronic components that can get damaged if submerged under water. This car in the photo has been flooded during a heavy rain. You still can see the water level mark in the speaker cover. Look for signs of moisture under the carpet. Check the trunk and the spare tire well for signs of water damage. A history report can also reveal flood damage. Be suspicious if the history report indicates that the car came from the recent flood area. Check if the wheel lock key and the tools to change a tire are present. Check if the car has a good spare tire and a working jack. If the wheels have wheel locks installed, make sure there is a wheel lock key. 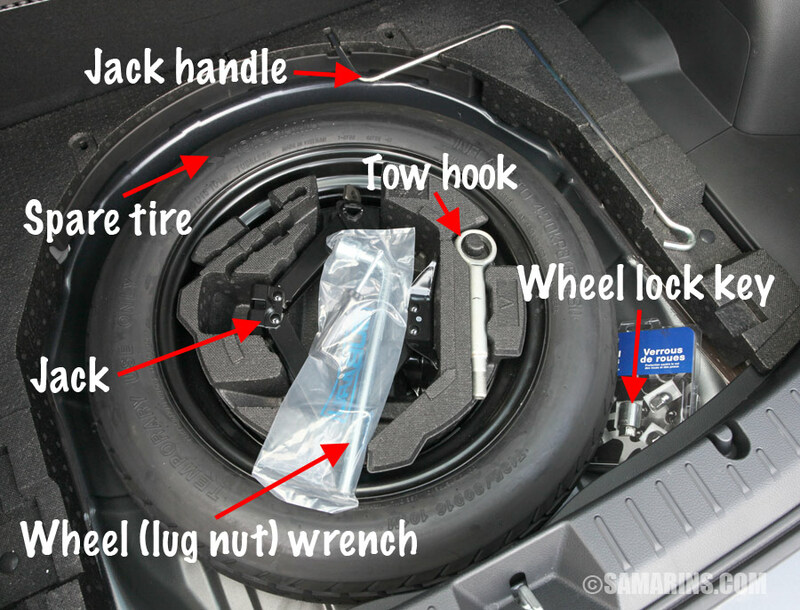 Watch out for moisture in the spare tire well. This truck has a spare tire secured underneath. 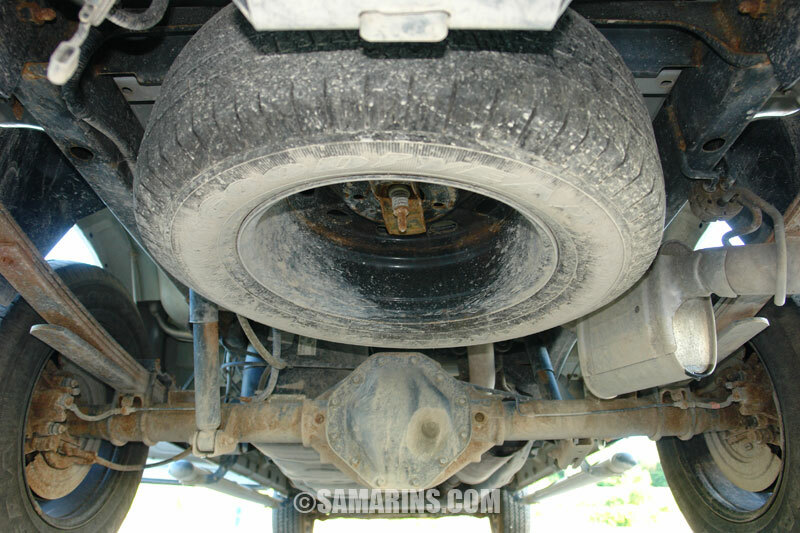 In many trucks, SUVs and minivans, a spare tire is secured under the car. 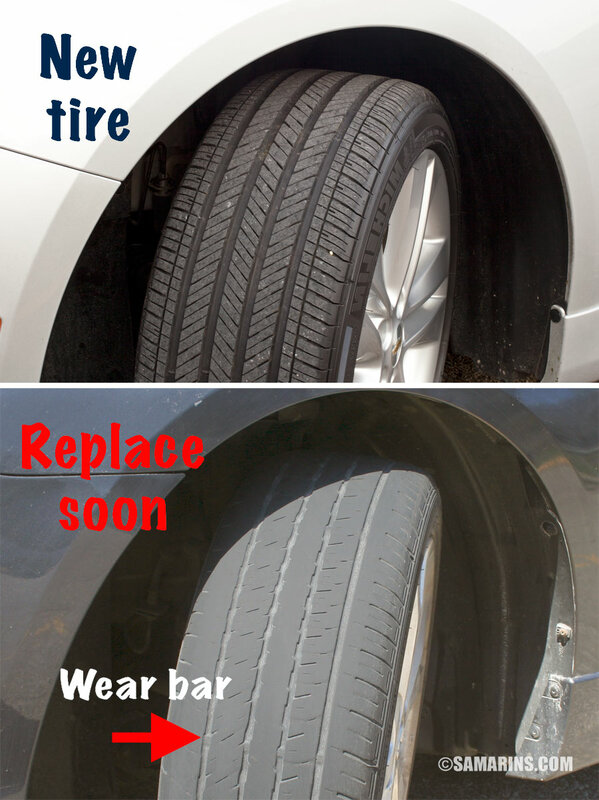 The mechanism that lowers the tire often gets rusted, making the spare tire useless in case of a flat. This is another area that should be inspected in a repair shop on the lift. Coolant leak from a crack in the radiator. If the engine bay looks clean and shiny, it doesn't mean that there is no leaks or other problems. 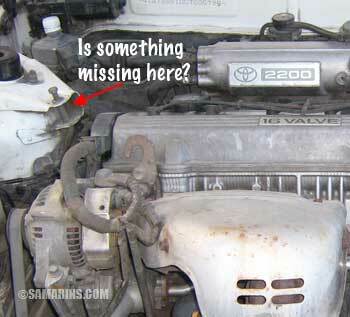 Dealers often shampoo the engine compartment before putting the car for sale. Watch out for leaks underneath the car. The only thing that should be dripping from under the car is water from the air conditioner drain when the A/C is running. The A/C drain is typically located under the passenger side of the firewall. Read more: signs of engine problems when buying a used car. This car needs a battery and a battery terminal to be replaced. 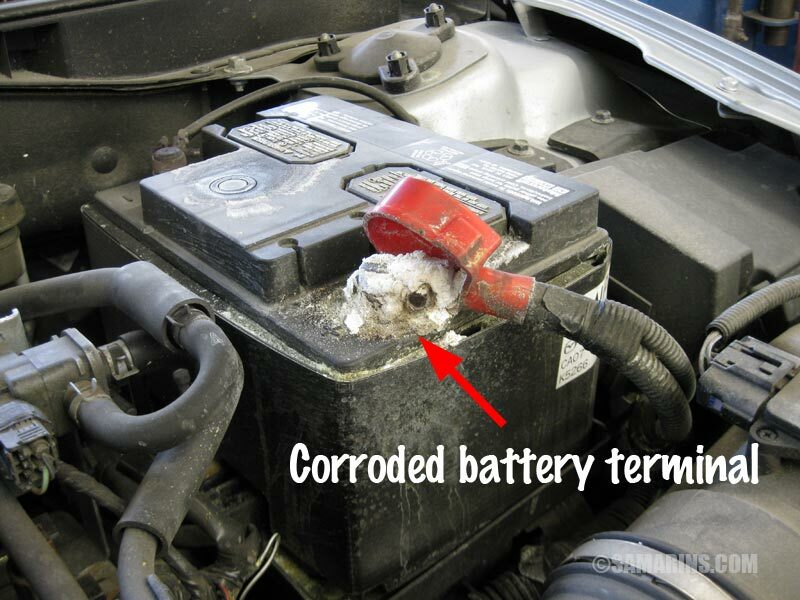 The battery terminal in this car is badly corroded. Not only this car needs a new battery and a new battery terminal, this suggests that this car hasn't been serviced regularly, otherwise this problem would have been fixed during one of the regular services. 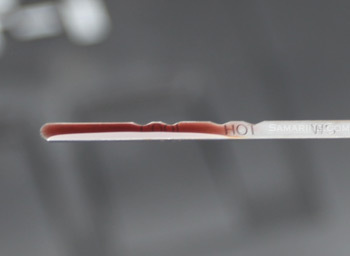 If the car has a transmission fluid dipstick (many modern cars don't have one), check the transmission fluid condition. To see better, drop some fluid on a white paper towel. Transmission fluid should be clean and transparent. If the transmission fluid looks very dirty, or has a burnt smell is a sign of excessive transmission wear. See: How to check transmission fluid. If something looks out of place or missing, suspect a sloppy repair job. This bolt in the photo clearly looks out of place. There supposed to be an engine mount in this place, but it's missing. This doesn't look like a high-quality repair. 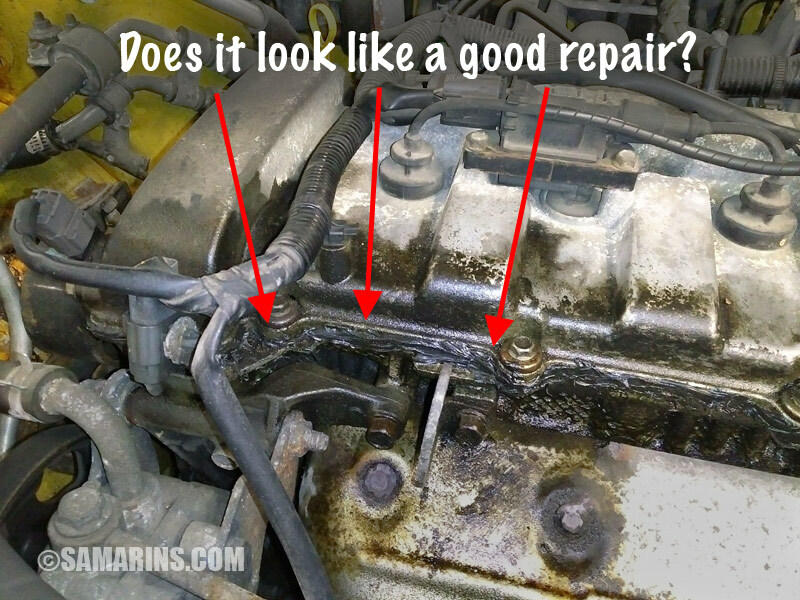 See two more examples of shoddy repairs: sloppy wiring job, bad valve cover leak repair. Before driving, make sure the car has a license plate(s) and insurance. Adjust the seat and mirrors and get familiar with controls. The longer you drive, the more chances you have to catch signs of problems. Often problems become more evident after the vehicle is fully warmed up. For example, an automatic transmission may start acting up only after 20-30 minutes of driving, or the engine may show signs of overheating when driven longer. Some issues (e.g. noisy wheel bearings, drivetrain vibration, alignment issues, noisy tires) are more noticeable when driving on the highway. The suspension and steering noises are easier to notice when driving slow over rough roads. If it's a continuously variable transmission or CVT, read more here: What to watch out for when buying a used car with a CVT (scroll down to the bottom of the post). Do you feel excessive engine vibration inside when the car idles in Drive? (possible bad engine mounts). Around the city: Do you notice any hesitation or jerking during acceleration? Does the engine feel smooth and responsive or sluggish? Do you feel jolts, slipping or delays when transmission shifts between gears? (avoid a car if yes). Any jolts when coming to a stop? (Transmission or AWD system issues, avoid a car). 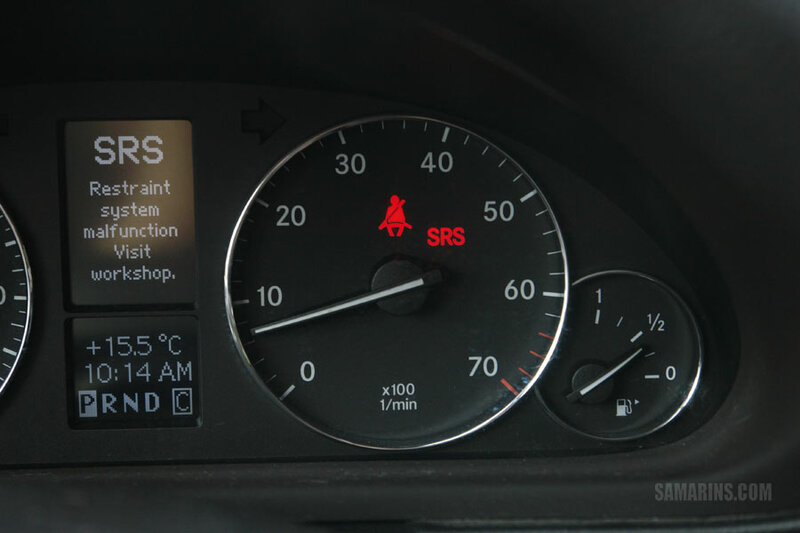 When stopped at the red light, is the engine idling smoothly or rpms jumping up and down? Does the hand brake hold the car from rolling on the incline? If anything doesn't feel right, consider test driving another car of the same model to compare. Discuss any issues that need to be addressed before signing the contract. For example, if the car needs new tires and the salesperson promises to "take care of it", discuss in details what kind of tires will be installed? Cheapest possible or of the reputable brand? It's best to do this in writing. The same goes for any warranty, check the contract and see what is covered. Verbal promises are just that, verbal promises. We recommend having the vehicle properly inspected by a knowledgeable mechanic before purchase. 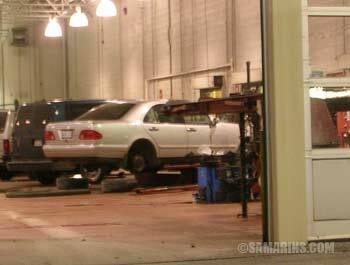 There are many components that can only be properly inspected when the car is lifted on the hoist. How to get it done? Many used car buyers arrange to have a pre-purchase inspection done a local new car dealer specialized in that brand. It may cost from $75 to $150. If possible, speak directly to the technician who did the inspection for the explanation of any findings and for general opinion on the car.